An interesting program – forced labor or building community through social awareness? At 8 a.m. on a sunny morning in April, people are sweeping the hilly streets of Kigali, the capital of Rwanda, with straw brooms and picking up stray bits of litter. The roads are empty of cars and all vehicles and shops are shuttered here — and across the country. 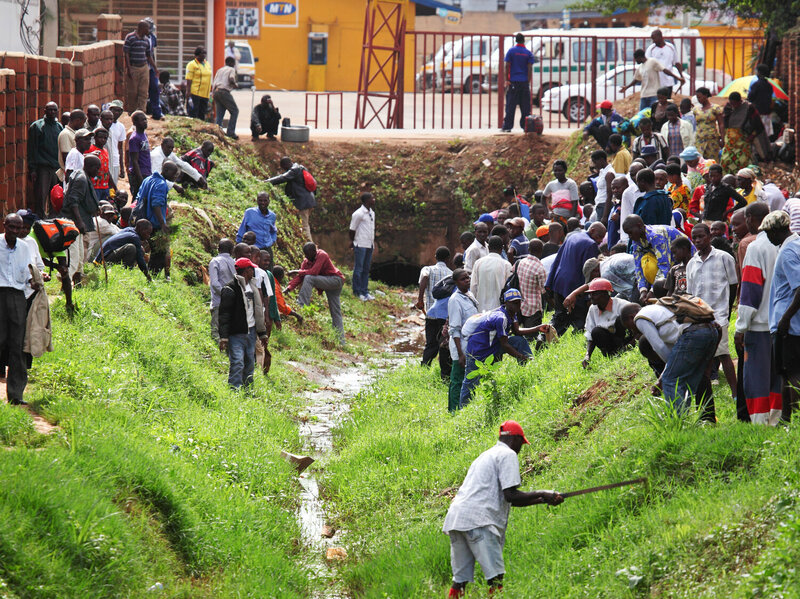 This is “Umuganda,” a community clean-up held on the last Saturday of every month. It’s one reason that Rwanda is renowned in Africa for its cleanliness. It’s not a volunteer project. Police monitor the streets – and can stop Rwandans who aren’t participating and make them clean up on the spot. Rwandans who don’t participate in the clean-up can be fined 5,000 francs, nearly $6, not a small sum when average income is about $150 a month. The name of the event is a Kinyarwanda word that translates as “coming together in common purpose.” But this seemingly positive definition belies a dark legacy. In the 1970s, Umuganda was the term used for a form of forced labor. And during three bloody months of the 1994 genocide, leaders exhorted ethnic Hutus to do Umuganda, to do their nefarious “job” of killing minority Tutsis and moderate Hutus. Indeed, to outsiders with fleeting knowledge of Rwanda, the country is synonymous with the 1994 genocide, when at least 800,000 people were killed in 100 days. But much has happened since then. The government has rebuilt the ravaged country through strict governance. President Paul Kagame’s repressive administration is controversial. Yet it has maintained stability in this poor country and spurred development in a region dogged by turmoil and corruption. The streets are quite safe — no small thing given violent crime is common in nearby countries like Kenya and Tanzania. In Rwanda, rules and laws are largely enforced. And one striking consequence is its remarkable cleanliness, well-paved main streets and sheen of order. That wasn’t always the case. Not long ago, in the early 2000s, garbage was more common in Rwanda. Today the country lacks the moldering roadside rubbish piles and the ditches choked with plastic bags that plague many low-income countries — and wealthy ones too. (New York’s subways suffer delays from garbage fires erupting on train tracks.) Rural areas in Rwanda are also clean. One reason for the country’s cleanliness is a decade-long ban on plastic bags. Other countries like Kenya have also outlawed plastic bags and though last year’s ban there is largely enforced, litter still blights parts of Rwanda’s larger neighbor. The other reason for Rwanda’s tidiness, of course, is Umuganda. Rwanda institutionalized Umuganda in its current form in 2009. It’s compulsory for all able-bodied people ages 18 to 65, and the president and cabinet members pitch in too for this monthly community service. Not everyone participates, especially in cities where it’s harder to keep track of the citizenry. Some are excused because they’re caring for their children or are ill. Others simply stay at home until 11 a.m.
Rwanda’s government also employs professional street sweepers, gardeners and road crews. But ordinary citizens definitely do their part. And since litter is now so scarce, for Umuganda people often do other community service, such as building roads, repairing houses or cultivating vegetable gardens. Not everyone is a supporter of Umuganda. On a mundane level, shopkeepers in Kigali grumble about lost business during Umuganda, and people who must travel are inconvenienced by the ban on driving. The concerns go far deeper than that. An oft-debated question is what is gained or lost by the country’s steely governance. Some people, especially outsiders, say Umuganda is forced labor imposed by a harsh regime that represses any dissent – part of a veneer of order and modernity that masks authoritarianism. And in a country with no compulsory military service, is mandatory clean-up OK? Without such stringent rules, could Rwanda revert to the turmoil and ethnic violence that nearly destroyed it 24 years ago? Would corruption and dysfunction take hold as with other countries in the region? Whatever the answers, cleanliness seems to have seeped into the country’s consciousness. Many Rwandans simply see Umuganda as community service – albeit mandatory. “Now it has become like a lifestyle. People are used to it,” a Rwandan man tells me matter-of-factly. Ignace Gasimba, a Rwandan doing Umuganda that Saturday in April, admits he used to litter. Now if he buys something and has packaging to dispose of, he waits to find a trash can. “I have to think twice,” he says. When Uwizeye visits neighboring countries like Uganda and sees litter, “It drives me crazy! I wish I could tell them, please come to Rwanda and see,” she says. In another part of town, the Kigali Genocide Memorial bustles with people trimming lush grass with machetes and mopping suds over a brick pathway. Olivier Nduhungirehe, Rwanda’s state minister for foreign affairs, also joins the grass-cutting. They are beautifying the grounds for the annual commemoration of 100 days of Rwanda’s genocide. The memorial period starts in April and ends on July 18. The Memorial’s manicured, idyllic surroundings contrast with its bloody foundation. More than 250,000 people are buried here in mass graves. Many were killed by ordinary people wielding machetes and farm tools to slaughter neighbors, colleagues, friends and children. That is all a stark contrast to the streets of Kigali in 2018. This entry was posted in Environmentalism, Service Learning and tagged Amy Yee, Community Service, Kigali, NPR, Paul Kagame, Rwanda, Service, Umuganda by olsond6. Bookmark the permalink. Reblogged this on Sacred Heart Greenwich 21st Century Skills Blog.